Fishing family or live aboard with an amazing amount of space. 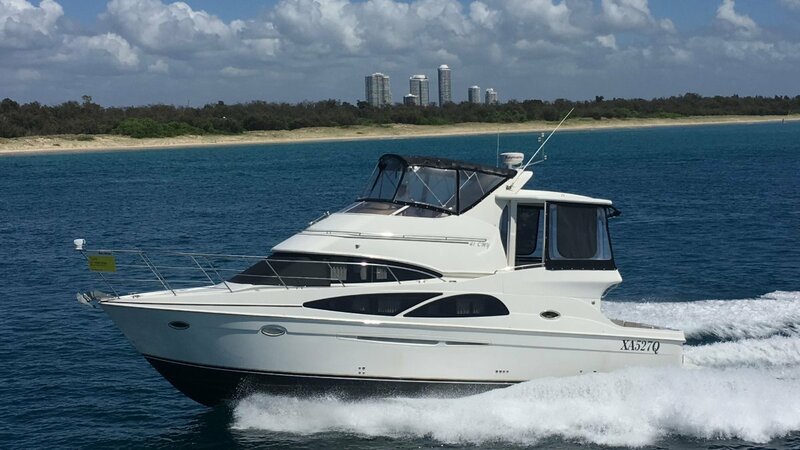 This Carver 41 cmy ( loa 43' ) is in beautiful condition with only 244 hours on her 370 hp D6 Volvo diesel engines, top of the line cruiser with many extras fitted with cherry wood through out and is fully air conditioned with three cool and heat units. Having every thing a boat owner wants with two separate double bed rooms with full en suites and tv / dvds, spacious saloon deck with plenty of room for all your family and friends with a well laid out kitchen with side by side fridge freezer, convection mic, 2 burner cook top and s/s sink. Granit bench tops, built in vacuum cleaner, Plenty of storage space Sit and enjoy eating in comfort on a proper dinner table or play cards what ever suit you, You can also lay back on the comfy lounge and watch the 32" LED tv and DVD. The sofa also fold out to a double bed. Up to the rear deck where you will find a x- large rear lounge with an abundance of space for a crowd to sit out in the breeze being protected from the element under the fibre glass top and all new clears and screens, plenty of storage with the two door storage locker plus storage under the rear lounge, up in the flybridge there is seating for all the family with a ice maker and wet bar. Dash and seats have their own custom covers. A Raymarine E80 colour radar - sounder gps chart plotter is there to get you you were ever your heart desires. You will also find the Hydraulic steering, the bow thruster control with wireless remote, vhf radio, music control unit, remote spot light and trim tabs, electric anchor winch. The bridge also has all new clears. The rear sports or fishing deck will entertain you for as long as you need with a great amount of space and safety, if you want you can step out on the x large rear platform with ladder to get into the water. The engine room has two D6 volvo diesel engines with low hours and a Kholer 8 kw generator with only 200 hours on it, an oil exchange unit is fitted, two battery charges keeps the 6 batteries in top condition, it will cruise at 8 knots with it suiting even the tightest miser on fuel, or get up and go to 25 mph for a fast cruise and if you are in a hurry you see up to 32 mph. Shore power is supplied by 240 volts and has 240 volt power points with earth leakage protection and shore power isolation transformers. Weather you are a keen fisherman, diver, skier, live a board or want great all round boat for the family this is it, Carpeted from front to back in all areas comfort is assured. She is keenly priced to sell by a private seller and represents one of the best values on the market today ! A WELL LAID OUT BOAT WITH ABUNDANCE OF SPACE AND ROOM, THAT WOULD SUIT JUST ABOUT ANY ONE, THE BOAT IS IN LOVERLY CONDITION BEING JUST POLISHED, 8 KNOTS ECO MODE OR CRUISE AT 25 MPH OR GET THERE FAST DOING 32 MPH, EASY TO DRIVE WITH ELECTRONIC CONTROLS AND WIRELESS REMOTE ON THE BOW THRUSTER, A MUST TO BE SEEN AND COMPARE FEATURE AND VALUE, GREAT FAMILY BOAT OR WHAT EVER YOUR HEART DESIRES, FROM THE EXTRA LARGE REAR PLATFORM FOR WATER SPORTS TO THE REAR COCKPIT AREA FOR THE KEEN FISHERMAN OR THE HARD COVERED FULLY SCREENED ENTERTAINMENT AREA KEEPING YOU OUT OF THE SUN AND ELEMENTS BUT STILL ENJOYING BEING ON THE WATER, THIS BOAT IS TO PLEASE, THIS JEWEL HAS ENOUGH GET UP AND GO TO DO WATER SKIING.